Learn more about getting ready for your new roof installation. Preparing for your new roof installation. It isn’t just about hiring a contractor and getting a new roof. When getting a new roof your property will become a construction zone. 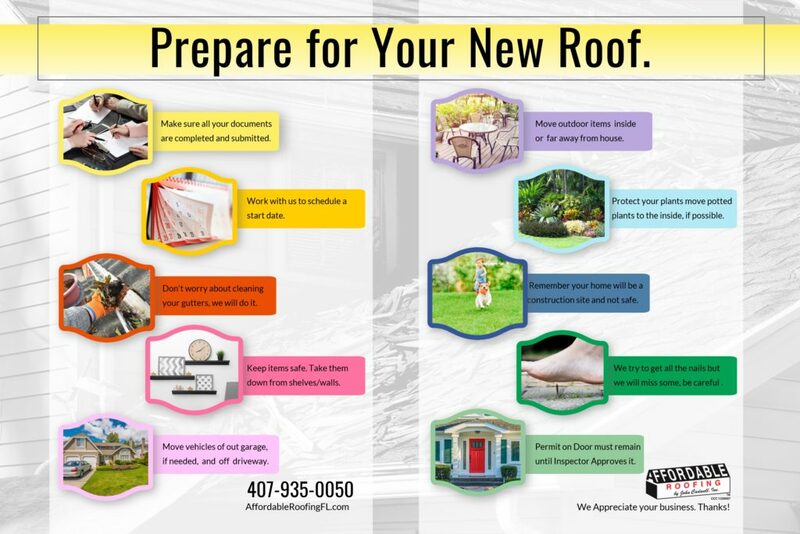 Affordable Roofing by John Cadwell, Inc. has provided a easy to view quick reference guide to help make the whole process easy and predictable. Select your material and color options, complete your contract and other required documents including your Notice of Commencement are key parts of starting your job. Your contractor is limited by how much they can do without you. Cooperation is the key. We first start with a time frame. Once we confirm all your paperwork is in good order and a date for all materials to be delivered we will work with you on your start date. Be mindful that roofing schedules can be unpredictable. Weather, material availability, labor shortage, and other unforeseen things can move your schedule. No need to worry about cleaning your gutters. Getting a new roof is messy and the gutter will collect lots of debris, but we will do our best to get them all cleaned out upon completion of the work. Tearing off a roof and replacing it is an intense physical process. Your home will shake, the noise will be loud. If you want to protect your items from possible damage it is important to take them down from walls and shelves to secure them. Vehicles need to be removed from the garage, carport, and driveway and relocated away from the home during the material delivery, dumpster drop-off and while the roofing job is in progress. Patio furniture, BBQ grills, birdhouses, etc. should be moved indoors or at least 20 ft from the house prior to material delivery and until job is complete to help prevent them from becoming damaged from falling debris. We will try our best to cover existing landscaping upon your request but any potted plants that can be moved inside is recommended. It is important to remember that your property will be a dangerous area, be extra cautious if children and animals are in the yard, we highly recommend refraining from using the property until the job is complete. We work hard to get all the nails, staples, and debris from the property. However, it is very likely that you will have some debris left behind. Be extremely careful around your property during the next several weeks. We recommend wearing shoes with a hard sole to help prevent injuries. You MUST keep the Permit on the Door until the County or City Inspector has Approved it. Removing the Permit prior to the Final Approval will result in additional fees and expenses, as per your contract. A few extra helpful tools to help your get ready for your new roof.